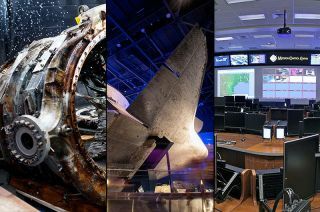 Space artifacts made a splash in 2013: from left, a recovered F-1 engine, space shuttle Atlantis on display and NASA's redesigned mission control room. The year 2013 has left its mark on space exploration history, but it was also a banner year for space artifacts from decades past. The prior 12 months saw a new type of U.S. commercial cargo spacecraft resupply the International Space Station, the first Canadian astronaut to command a space mission, the first Indian interplanetary probe lift off for Mars and the first Chinese moon landing. But 2013 also marked the reemergence of four-decade-old rocket parts, the re-lighting of an equally-old engine piece, the debut of a retired space shuttle and the redesign of the orbiter's mission control. Here is a look back at some of 2013's milestones in space memorabilia. No other rocket relic made as big a splash in 2013 as did the Apollo Saturn V's F-1 engine. Found on the ocean floor in 2012, it took a year before an expedition financed by Amazon CEO Jeff Bezos was able to raise the mangled engineering masterpiecesin March. From there, the more than 25,000 pounds (11,340 kg) of F-1 engine components were trucked inland to the Kansas Cosmosphere, where they're still undergoing a meticulous conservation. And if that wasn't enough for one year, another F-1 engine part reentered NASA service in 2013. The gas generator from a never-launched engine was refurbished and re-fired as part of the agency's efforts to develop new engines for its next-generation Space Launch System (SLS). This year saw the first anniversaries of shuttles Discovery and Endeavour going on public display at the Smithsonian and California Science Center. For the two orbiters' sister ships, Atlantis and Enterprise, 2013 marked new exhibits. Trading its protective shrink-wrap for theatrical lighting, the space shuttle Atlantis launched on display in June to rave reviews. NASA's Kennedy Space Center Visitor Complex in Florida put the shuttle back into space by blending the respect of a museum with the stagecraft of a theme park. Atlantis, mounted off the ground and steeply tilted to one side, seemingly took flight again, this time just outside the arm's reach of its awestruck spectators. Whereas, for the prototype Enterprise at the Intrepid Sea, Air & Space Museum in New York City, it was a proverbial crash back to Earth that necessitated a reopening in 2013. Surviving "superstorm" Sandy and its pressurized pavilion deflating over it last year, Enterprise reemerged inside a new walled-in enclosurein July. With its debut, came new exhibits, a companion Soyuz spacecraft on display, and a new status — the first shuttle to be added to the National Register of Historic Places. And while on the subject of titles, Space Center Houston's shuttle mockup was given a name, Independence, and the pledge of a new display 'platform' coming in 2015, NASA's original Shuttle Carrier Aircraft (SCA). Dormant since Atlantis flew the shuttle's final mission in July 2011, the launch pad and mission control that served as the settings for many historic flights were repurposed in 2013. In January, NASA began removing the shuttle equipment from its flight control room (FCR) inside the Christopher C. Kraft Mission Control Center at Johnson Space Center in Houston. Nine months later, the room's new look and feel was revealed — gone were the iconic "big blue consoles" and in their place "clean" wood-panel workstations. The upgrade, dubbed MCC-21, was to ready the room for NASA's next-generation spacecraft and missions, though the transformed shuttle FCR will temporarily be employed in support of International Space Station as that program's control room undergoes the same changes in 2014. Launch Complex 39A at Kennedy Space Center in Florida is also set to change — owners. Unlike mission control, which NASA still has a use for, the agency's budget could no longer support maintaining the unneeded launch pad. So in May, the search began for a commercial partner to take over the site. Earlier this month, NASA selected SpaceX to negotiate a new lease for Complex 39A. The company, which already launches cargo to the space station for NASA, has said it may use the pad for its planned heavy-lift rockets, as well as perhaps to launch NASA astronauts to the station. Click through to collectSPACE.com to read more about the space artifact events of 2013.